The former Black Cats chairman has spoken to current owner Ellis Short about returning with a new consortium. 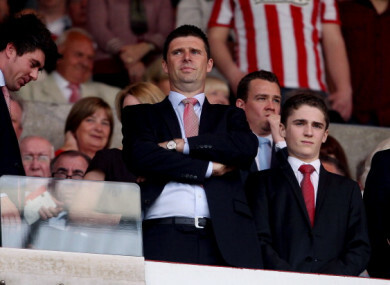 Quinn at the Stadium of Light during his time as club chairman in 2011. EX-IRELAND STRIKER Niall Quinn has reportedly held discussions with Sunderland owner Ellis Short about a possible takeover. The BBC are reporting that the 51-year-old is fronting a consortium backed by two unnamed businessmen from Ireland and the north-east of England. Quinn, a Black Cats legend having spent six years there as a player, took over as chairman of Sunderland in the summer of 2006 after it was bought out by the Irish-based Drumavilla Consortium. Following a brief spell as manager, he brought in Roy Keane to fill the position and they immediately won promotion back to the Premier League. However, Texan Short gained control in May 2009 and replaced Quinn as chairman. He was given the position of Director of International Development but stepped down in February 2012. Quinn has been involved in various business ventures and media work since then, although he quit his punditry role at Sky Sports last August. Sunderland, managed by former Wales boss Chris Coleman, are facing the prospect of playing in English football’s third tier next season as they currently sit bottom of the Championship with eight matches to play. Short has said publicly that he would be interested in selling the club, and he is believed to be looking for around £50 million. Email “Niall Quinn in Sunderland takeover talks - report”. Feedback on “Niall Quinn in Sunderland takeover talks - report”.